I keep seeing the term mud switch. Is that the same as the tone switch or something else entirely? Check out Gibson's Varitone sometime. 6 positions, each muddier than the last. The mud switch is IMO the worst Gretsch addition ever. (whoever thought that one up?) It makes my Gent sound like someone's thrown a duvet over the amp (or even two duvets in the worst 'treble cut' position.) A total waste of capacitors.. It always should have been a phase reverse switch, which would have made the geetar much more versatile and allowed the volume controls to make subtle tone adjustments to the in and out of phase balance. Conversely, Gibson's Varitone is eminently use-able, (for some) and works on a ' much changed over the years' 'Q' filter principle. Have you heard a Gretsch with the pickups out of phase? No thanks, man. With the right caps, the tone switch is useful and handy. For a great discussion of these and other delightful Websterisms, see this thread. But even Mr Webster knew enough not to wire in a phase reverse! Thanks to all for the speedy response. I'm now in the know on the mud switch! Since I'm planning on installing TV-HTs and the pre wired harness w/tone (aka mud switch), has anyone had experience with this setup to know what capacitors TV Jones uses on their rig? To be honest, it's been over 20 years since I've played this guitar and my recollection of how the mud sounded in the different positions is vague and highly suspect. As in your guitar suddenly sounds funky and you look down, realize the mud switch is on and quickly switch it off. That’s perfect, Synchro. Ask TV when you order the pups to recommend cap values for them. He knows. Fabulous, I certainly will ask. Thanks, Konrad, I needed a good laugh, that lightened it up a bit! As I said, my recollection of the sounds is not very good, but I do seem to to remember flipping that switch up once and doing a double take-right in the middle of a number! Luckily it was a practice session, everything went silent and the vocalist looked at me and said " if you do that at the gig, you better run!" Love the mud switch with vintage values, it’s in the zone. George used mud switch in cool ways. 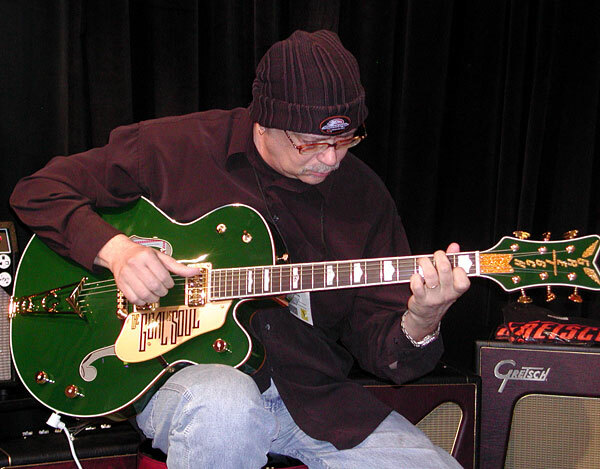 In 2008, I sat and listened to Steve Hunter play meditative, introspective kinda jazz for 45 minutes in the midst of the noise and confusion of NAMM - playing a Bono Irish Falcon with full mud. It was sublime and mesmerizing, dark and yet chimey like low muffled tolling bells. I picked up the same guitar, same amp and settings, and got...mud. Maybe the tone is so polarizing because we can’t all use it. A little like the “rhythm circuit” on a Jazzmaster, it takes an inner ear to hear it, a soul with something to say through it, and the touch to bring it out. Geez, I may have audio of that performance. I should dig it out and post some. If you could, I would love to hear it. It’s your opportunity to do a mod! I took mine out and put in a new hot rod harness... nothing of it left except the hole it once resisted in. Pulled it like a bad tooth! I looked for that but couldn't find it, would love to see/hear it again. Keep in mind Steve can make anything sound good and when he has something great it's off the charts. Great guitar, pickups and fingers but no mud switch in this example. I heart the mud switch. Use it quite a bit. If you wanna sound like Wes Montgomery use the Mud switch. Besides that, The Tone switch is almost useless, just ask Brian Setzer. Wow! Absolutely magnificent! Thanks, Curt. Recorded at the Gretsch booth, January 2008. Steve played the Bono Irish Falcon through a Gretsch Variety (or it might have been an Executive) for a couple sets of improvised fingerstyle jazz. This is the better recorded of the two sets. Good golly miss Molly... thanks for finding this, Proteus. I listened to the first one, had some trouble due to my signal fluctuating so I downloaded it. Steve sounds great, I love his style. I'm downloading the others now so I can enjoy them with no unwanted pauses due to poor phone service. I never learned to finger pick; by the time I got around to trying it as a youngster I had already learned to play with a plectrum. Every time I sat down to try it, I would get frustrated and grab the pick up and say, "there, I can play like this!" Now that I'm retired and older and hopefully a little wiser, maybe I'll try again to impose a little self discipline. I had always heard that Stills solo on Wooden Ships in the studio version of the song was on an Esquire in the bass position, which was sort of similar to a mud switch and predated it. My first copy of that album had the vocal mixing error on that song.